They are normally used for general purpose, and they are sorted in two types as mercury and organic liquid. Mercury-in-glass thermometers' measuring range is between -50 to 600 degree C,and organic liquid-in-glass thermometers' range is between -100 to 200 degree C coding with red or blue color. 3)The Thread of 1/2" BSP,NPT,BSPT or M20X1.5 etc,or as customer's request. 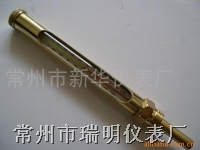 4)The Metallic Thermometer with a protective metal sleeve is designed to use with boilers or equipments directly.